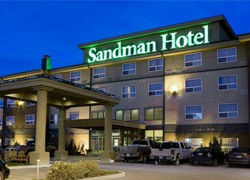 Sandman Hotel Saskatoon, offering comfort, convenience and value. Your home away from home. Description Located just minutes from the airport in the north part of the city, the Sandman Hotel offers four secure access floors with a total of 122 guest rooms; including standard, executive, one-bedroom suites and Jacuzzi suites. One-bedroom and Jacuzzi suites include upgraded amenities and terry bathrobes. Meeting facilities include three boardrooms and two banquet rooms. Facilities accommodate meetings and receptions in a variety of settings for up to 110 people. All of the meeting rooms offer natural light. The Sandman offers an on-site 24-hour restaurant. Denny’s 24-Hour Restaurant, home of the Grand Slam breakfast, provides meals any time of the day or night, and also provides room service from 7 a.m. to 11 p.m. daily. The Shark Club Bar & Grill is a sports bar offering big-screen televisions, food and beverages. Guests have access to an indoor heated pool and whirlpool, a private Business Centre for e-mail access, printing and word processing, ample ground-level parking and complimentary airport shuttle service.